I don't know where to begin when it comes to guest writer Lisa Wong. Technical writer by trade, freelance writer published in both Fame'd and Flare, highly successful blogger and so much more! She is bar none one of the most talented and focused professionals I have ever had the privilege to work. Fame'd chose to recognize her contribution at their 2011 magazine launch - an honour that was well-deserved. 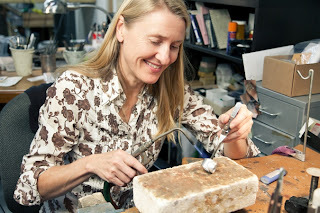 Below is her Behind the Scenes article on jewellery designer Penilla Arhmsteadt published in September 2011. Enjoy! All product photos from website. followed her heart by moving to Vancouver in 1988 with her (now ex) husband. She had no idea what to expect of her new home. Compared to her native city Stockholm, a European capital rich in culture and history, Vancouver seemed a cultural backwater lacking in beauty and history. As the years went by though, her unfavourable impression of this city softened. She began realizing that the beauty of Vancouver lay in its mountains, greenery, blue skies and ocean, not in grand buildings and historic monuments. Although she tries to return to Sweden to visit loved ones every couple of years, these days she is proud to call Vancouver home. Ahrnstedt stumbled upon jewelry design in a serendipitous way. She started off with a year of metal-smithing courses in which she learned to make bowls and spoons, then studied industrial design at Emily Carr briefly before discovering she hated the discipline. Her search for a new pursuit led to jewelry-making courses at Vancouver Community College; it was in jewelry-making that she found her true calling. Initial designs used silver, copper, brass and relatively inexpensive stones to save on raw material costs. She and a friend opened a small studio on Granville and Robson after she graduated from VCC in 1991. "We were upstairs in a building with a manually operated elevator," she recalls. The downtown urban landscape looked quite different then, although it was already on its way to becoming the glitzy retail hub we know today. Robson Street's mom and pop shops were disappearing to make way for large flagship stores from international chains. The local fashion industry was still in its early days. Ahrnstedt could simply walk into retailers and talk to managers about stocking her designs, something that new designers can rarely do these days with stiffer competition and increasingly formalized buying processes. She continued designing jewelry and working part-time jobs until having children forced her to choose one or the other. Luckily for fans of her work, she chose to do jewelry design full-time. In Ahrnstedt's eyes, Vancouver fashion headed in two directions during the nineties. While downtown Vancouver became more cosmopolitan, Main Street emerged as a haven for all things local, quirky and indie. Designers and boutiques sprang up. Mainstream media started paying attention to the local scene. In the mid-nineties, papers like the Vancouver Sun began devoting coverage to homegrown art and fashion. "I think the increase in [large international] flagships will continue as Vancouver grows, but I hope it retains the crazy culture," she says, referring to this city's plucky independent spirit and informal approach to cultural expression. She has also seen the rise of institutions that we now take for granted such as Vancouver Fashion Week and Portobello West. "I remember when they started Vancouver Fashion Week," she reminisces before recounting how organizers had to "practically beg, borrow and steal" to put on a show and get reluctant designers and sponsors to participate. A yearning to be part of the artisanal atmosphere of Granville Island prompted Ahrnstedt to apply for a lease there. It took seven years to get it, but she has been in her current studio space for ten years and counting and loves every moment of it. Shops on the Island have come and gone, but Aurum-Argentum, the studio she shares with two other jewelry designers, remains strong by focusing on locally made fine jewelry and custom projects. "When you start doing jewelry, you can do more mass-produced pieces or what I'm doing: more custom, more high-end. But whatever you're doing, it's fiercely competitive." "When I design for myself, I draw on a lot of historical references like the antiquities and the Renaissance. The jewelry becomes an illustration in a story. I try to make jewelry that I like to wear. I'm not a minimalist; I'm a magpie at heart." Her sterling silver and 18 karat gold creations are bold hefty pieces. Oxidized and hammered metal textures, big chain links and bezel settings are just some of her style signatures. She loves working with tourmalines, spinel and rose-cut diamonds. At Aurum-Argentum, customers can admire examples of her ready-made pieces: earrings and necklaces with colourful stones in raindrop-shaped bezel settings, dramatic cuffs, intricate pendants inspired by Greek mythology. Some customers come in repeatedly to admire pieces they're saving for. "We call them, in the most loving sense of the word, jewelry stalkers," she laughs. Her custom work is just as popular. The process for a commission can take anywhere from a few weeks to six months depending on the size and complexity of the piece. After two decades in business, what advice does Ahrnstedt have for fashion industry rookies? "Get your business in order. Bookkeeping, marketing...I still feel like I'm fumbling sometimes and it's nice to be more savvy." It also helps to have a clear vision of what you want to accomplish. "Know what you want to do. I think you have to know much quicker in your career today than before." As Ahrnstedt can tell you, talent and vision can take you to wonderful places, like a new city that becomes an unlikely home. For more information or to view Pernilla Ahrnstedt's pieces, visit her website at www.pernilla.ca.